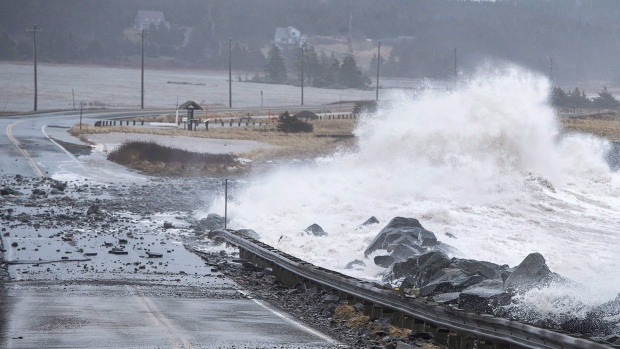 HALIFAX -- Experts on flooding risks say worrying figures released this week on the rising seas in Atlantic Canada should prompt governments to move more swiftly to protect coastal areas and vital transport links. Blair Feltmate, head of the Intact Centre on Climate Adaptation at the University of Waterloo, calls the projections "a wake-up call and a call to arms." He's reacting to Chapter 7 of "Canada's Changing Climate Report," which projects 75 centimetres to one metre of relative sea level rise for the East Coast. Federal scientists presented the document earlier this week, noting Canada is warming at twice the rate of the rest of the globe in a now irreversible process. Feltmate points to predictions for quadrupling of flooding along the Halifax waterfront by mid-century as a signal buildings will have to be constructed to cope with higher tidal surges. In addition, he says the study highlights the vulnerability of the Chignecto Isthmus -- a low-lying, 20-kilometre band of land that joins Nova Scotia to New Brunswick. Ocean scientists said in the report that the Atlantic region is facing a dual effect of rising seas and falling coastlines. It notes that while in much of the country the coast is rebounding from glaciation -- helping counter sea-level rise -- the eastern coasts are continuing to sink.